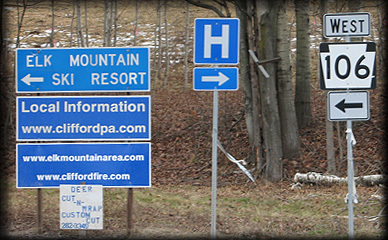 When you get off of Route 81 (aka “The Penn-Can”) at the intersection of Routes 374 and 106, you’ll see a new sign listing web addresses for area information. Cliffordpa.com is run by the Clifford Historical Society, who in 2006 organized the Clifford Bicentennial celebration. Check their web site for information on Clifford’s past, and present, and to purchase Clifford calendars and the Clifford Bicentennial coffee table book, recently nominated for a state award. Cliffordfire.com shows pictures of recent activities of the folks who man Station 18, home of the Clifford Volunteer Fire company. It is sometimes easy to forget just how much we rely on the tireless efforts of these volunteers to help keep us safe, and to rescue us when things go wrong. …and the fireman also make the absolutely best darn barbecue chicken you’ll ever taste! Purchasing a chicken dinner at the Clifford Fireman’s picnic, and various other events throughout the year benefits the fire company, and thus helps benefit those of us who live, and visit the area. Many volunteer fireman also serve on the Elk Mountain Ski Patrol.